Are you ready to reach more people for Jesus by building a business or ministry online? We already talked about 5 reasons you need a blog if you’re called to ministry. In this post, we are going to focus on how to get started with the very basics of reaching people online: message, branding, and design. A lot of people might think that you should start with more glamorous steps than the ones I list below. However, I encourage you to BEWARE. If you put the cart before the horse, you’ll be in danger of starting something that won’t fly in the long run. A few foundational steps at the very beginning will spare you a world of possible mistakes and hurt later on. 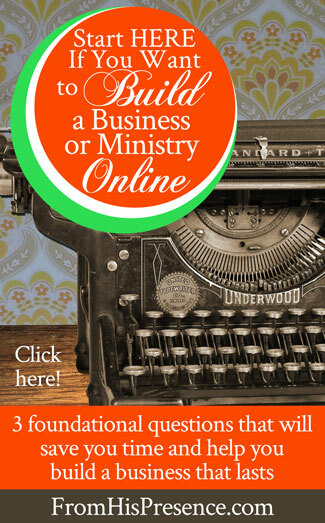 So, what’s the first step to building a business or ministry online? The first step is clearly defining who you are and what you’re called to do. Every person is an expert at something, and you’re called to do something specific. Related: Read my prophetic word for entrepreneurs here, in Your Dream Is Your Key to Financial Breakthrough! No matter where your expertise lies, you have a message that you, and only you, can convey to the world. Deciding out what that message of your life is, focusing on it, and presenting it to the world in an attractive way is called branding … and good branding results in increased sales, increased reach, and stronger influence. In this post, your assignment is to identify some key components of your ministry/blogging/online strategy in three different areas. 1. If you could spend the rest of your life doing or talking about one thing, what would it be? What would be your message to the world? These questions are extremely helpful in figuring out what God is calling you to do. And knowing who you are and what you’re called to do is extremely important. Another way to ask yourself this: If you could tell people anything and have them listen to you and receive your message, what’s the one thing you would want them to know? And if they got that one message, what are several other sub-points you’d want them to really get as well? Click the meme to share it on Facebook! 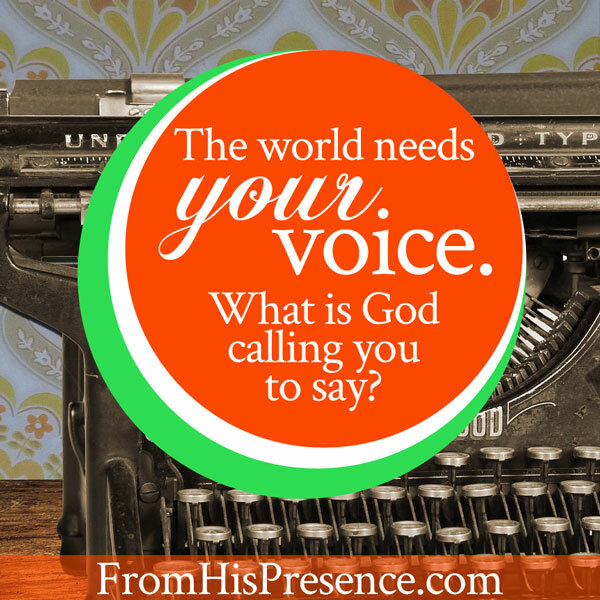 For me personally, I know I’m called to preach, to write, and to minister prophetically. I am called to equip, empower, and build up God’s people; to help them walk in the total victory and power that Jesus purchased for us on the cross. That is my message. What’s your message? No matter what your message is, write down your thoughts in answer to these questions. The ideas you just had are very likely the areas to which you are called, and ALSO the areas in which you are an expert–whether you ever thought of yourself as an expert or not. 🙂 They are the ideas that you will be able to communicate most powerfully in your writing and products, and they are the messages people will clamor to hear. 2. What caption could you write in just a few words that over-arches and summarizes all those points that you thought of above? Write down some ideas for captions/umbrella phrases that summarize your message. Then pick your favorite. That caption is called your tagline. I had to do this first a couple of years ago when I went to design a business card. I was already blogging–but about pretty much whatever crossed my mind. So I thought about my truest passions, and the Holy Spirit quickened to me one day that my main message is the manifest presence of God. When you identify your core message and the thing(s) at which you are an expert, not only will it boost your confidence, but it will also boost your READER’s confidence in you! Resource: If you’re going to start building your online platform, you MUST READ this book: Platform: Get Noticed in a Noisy World. If you take wrong steps at the beginning level, it can take you years to figure out why things aren’t working. But if you build a solid foundation from the beginning, you’ll be set up for success over the long haul. Platform tells you how to build your website right, and how to reach people the right way in the social media age … and it will save you from a thousand potential errors. GET THIS BOOK! Click the link above to order it on Amazon. 3. Think about the overall look and feel you want your ministry, brand, and website to have. What kinds of services or goods do you want to make available to your readers/tribe? How do you want to reach people, and what kind of technology should your website support to allow you to do that? Web design has changed A LOT over the last few years, even over the last year. Mobile-optimization standards have also changed a lot. Current web trends are all about telling a story and offering solutions at first glance. Long front pages used to be taboo, but now they are hot because they tell stories easily. People are looking to connect with people; business has become personal. Your would-be customers want to know you, your story, and what you can offer them–and they want all of it to look pretty and attractive at first glance. So. If you have a website already, does your website fit the bill? Is your theme modern, attractive, and mobile-optimized? And if you don’t have one yet, what do you want your site to look like? Find an example to use as your inspiration. In order to answer this question, I want to encourage you to check out a few different websites that I feel have modern, clean, attractive design. Just click on these and pay attention to the look and feel of the sites. Some of them you may like; others not. But watch to see what you do like, what you don’t, and how they have branded and presented themselves. what calls to action and/or solutions to reader problems do you see right at first glance on their pages? www.AmandaAbella.com: This site was used as one of the gallery demos by the theme company from which I bought my theme (StudioPress). I actually contacted her designer, who wanted to charge me $7,000 for a similar site design. I didn’t have $7,000 to spend, so I purchased a similar child theme and built mine myself. It’s still a work in process for me, but I’ve been very happy with it. As you’re looking at these sites, begin to think about how you’d like your site and branding to look–how you want to present your message to the world. Just get a picture in your head of how your material, your newly-focused topics, and your name, logo, and tagline could look. We’ll begin taking additional steps toward branding in the next challenge. 1) What is your unique message to the world? 3) Is your site modern and appealing? Or does it need an update–and if so, what would you love for your update to look like? Don’t worry yet about putting the pieces together. I’ll post a different post about how to do that. But DO get some ideas in your head. Open your heart to high possibilities, and let yourself dream. You’ll get an email when new content is posted, as well as exclusive prophetic words, teaching material, and more. You’ll also receive my new Supernatural Lifestyle Toolkit (a $28 value) for free when you confirm! I’m praying earnestly for partners who will help me in my work of being a domestic missionary. Is Papa calling you? Find out why, how, and what’s in it for you here. Note: The Amazon links above are my affiliate links. This means that, if you click through my link to purchase a resource on Amazon, Amazon will pay me a small commission (at no additional cost to you of course). Thanks in advance for helping me reach the world for Jesus! And if you love to read legal mumbo-jumbo, you can delight yourself in my disclosure policy here. 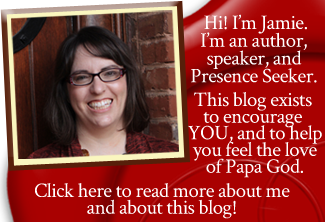 I am very happy that I found your blog and this article about how to build a ministry online. I am also cold to prach and teach, to minister prophetically, to set the captives free and to heal the brocken hearted. I also am a pioneer like you. During the last weeks I did have a look at different websites and also tried to put together a personal tagline. It is not easy at all specially if I have only very little money. But Jesus is so good because he gave me allready a idea how to start. So I start with teachings on CD‘s which I can sell. In Switzerland we do not have much teachings and churches about the supernatural. We habe a very lot of legalistic churches, the ground ist very hard. I have big dreams for the christians in my country, my heart burns to bring them a message that goes deeper. Thanks a lot for your blog and may Good bless you even more! Thank you so much for this post!! God has called me to an online ministry and your post was informative. God Bless You!! !